Don’t you love it when someone says “here, try this…it tastes just like chicken”. Of course, you try it and think how it tastes nothing at all like chicken, besides, the only thing that tastes like chicken is chicken. I hate being duped. Which is why I try hard to deliver food that tastes like it’s namesake. Take this Garlic Bread Dip. Is it made with Garlic bread? Heck no, but I sure think it tastes like garlic bread. And no, these cherry pie energy bites are not made with cherry pie but are highly reminiscent of the favorite fruit-filled dessert. 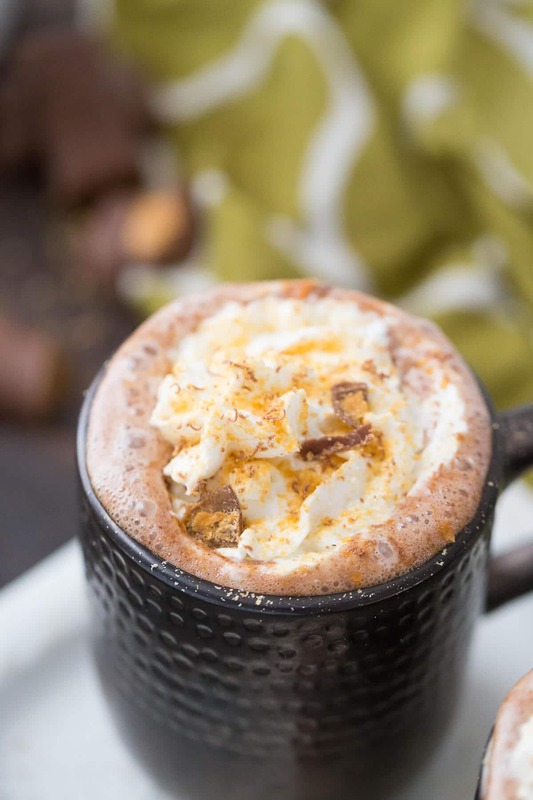 Contrary to the name, this hot cocoa recipe is NOT made with Butterfinger candies. It’s made with booze…and chocolate. That alone should sell you on this recipe. 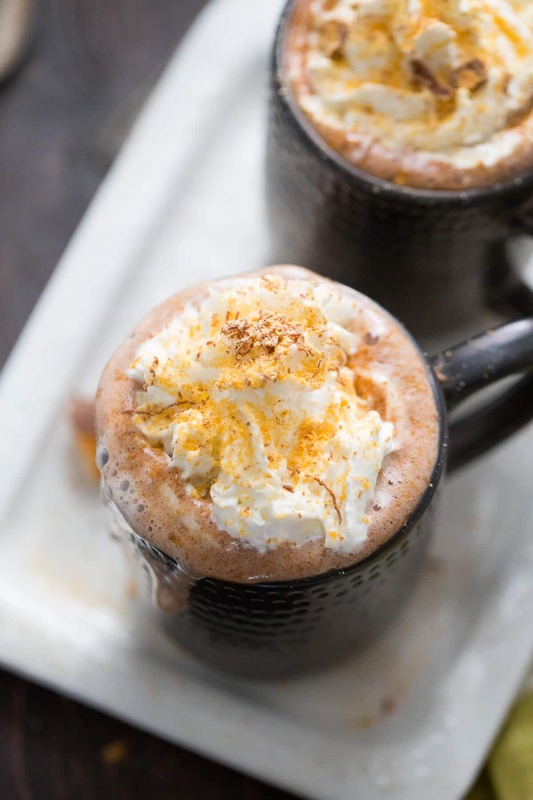 This recipe starts much like this Mexican Hot Chocolate and this Mocha Mudslide Hot Chocolate (also an excellent boozy cocoa). You whisk together sugar, cocoa powder cream, and milk. Semi-sweet chocolate is whisked in and stirred until melted smooth and creamy. The “Butterfinger” flavor comes from some of my favorite liqueurs; Kahlua, Baileys, and (drum roll please…) Buttershots. You can adjust the alcohol to suit your tastes. You can omit the alcohol, and you may be able to melt actual Butterfinger candies into the cocoa, but I have not experimented with this myself. 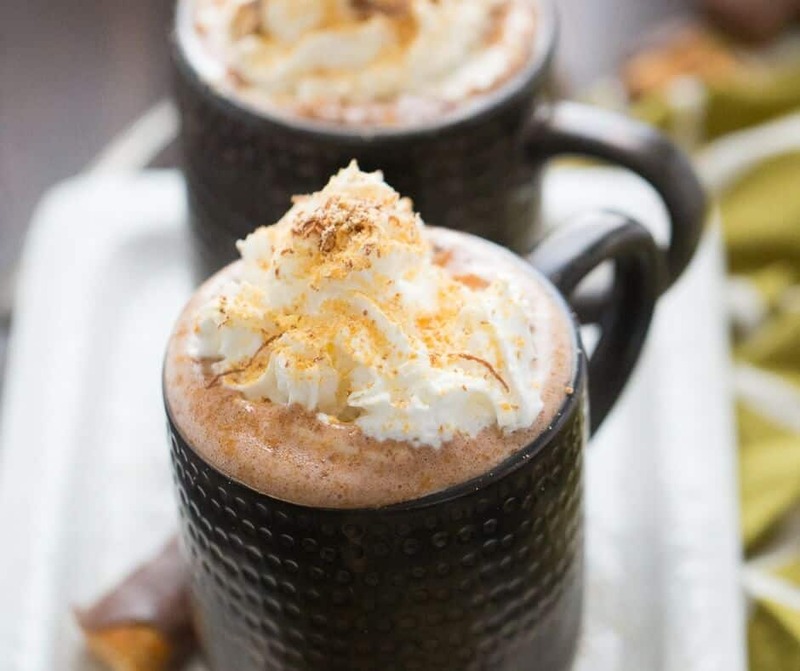 This is the kind of hot cocoa recipe that adds a fire to your belly. 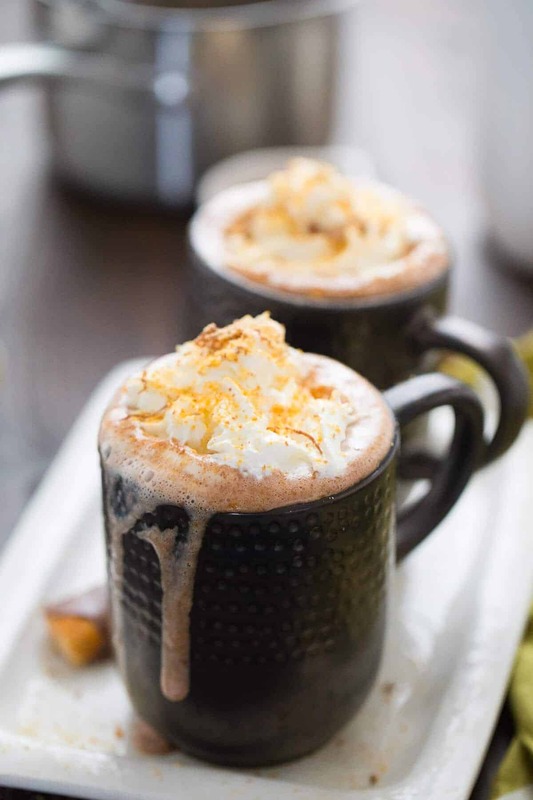 The heat from the hot chocolate and the warmth from the alcohol is pure, sippable comfort. 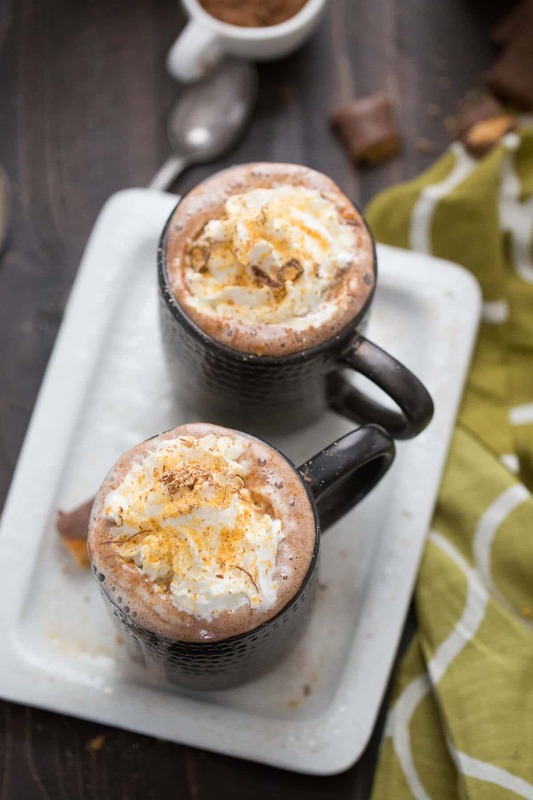 Top your mugs of cocoa with chopped Butterfingers to bring the flavors home. This recipe translates to other warm-weather beverages as well; think boozy Butterfinger frozen hot chocolate or Butterfinger milkshakes. My mouth is watering at the thought. 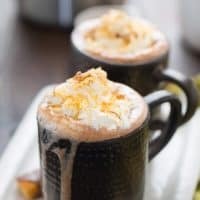 Those frosty beverages will have to wait, for now, I’m all about this warm and inviting HOT cocoa! In a small saucepan whisk together the sugar and cocoa powder. Slowly whisk in milk and heavy cream. Continue to whisk mixture until sugar and cocoa have dissolved. Add chocolate chips and whisk until chocolate is completely melted and the mixture is smooth. Remove cocoa from heat and stir in alcohol. Pour cocoa into two mugs. Garnish with whipped cream and chopped candies if desired.